ALERT: A wet and windy afternoon for most of us in central Indiana. A few thunderstorms are possible as well but we are not expecting severe weather. 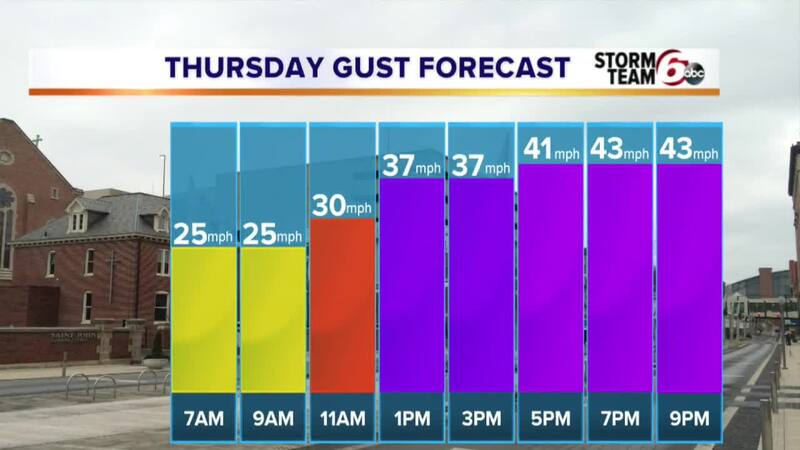 Wind gusts could be over 30 mph this afternoon. A powerful storm system will move through the area during the day today bringing us rain, wind and mild temperatures. The heaviest of the rain will be during the afternoon and early evening hours with maybe even a few rumbles of thunder. The umbrella might not be your best option this afternoon cause it will also be very windy. The wind will pick up as the day goes on with gusts this afternoon at or over 30 mph so the jacket might be the better option. Temperatures today will climb all day long with our high occurring likely around 11 PM tonight at 55 degrees. Temperatures tomorrow will be the complete opposite. We will start off in the 50s and see temperatures fall throughout the day into the 40s and eventually 30s by late in the afternoon. Any lingering showers will end quickly during the morning leaving us with just a dry and blustery afternoon. The weekend will be quiet and seasonable with highs around 40 degrees and partly cloudy skies. Our next storms arrives Monday with a rain snow mix transitioning over to light snow possible to ring in the New Year.